I love meals that make use of the random food stuffs long forgotten in the fridge. Even though I meal plan, I still end up with food that hasn’t met it’s culinary destiny, and might be on the verge of becoming compost. Sometimes it’s half a head of lettuce, or a nub of cheese. So often I find myself with half empty bottles of sauces and condiments I purchased and used once – maybe for a specific recipe, or maybe because it just looked interesting and I had a weak moment when I bought it. They clutter up the fridge, and get pushed back further and further until they are long forgotten and become a science experiment. You know what I’m talking about. I had bought this bottle of buffalo sauce to make these cauliflower buffalo wings awhile back, which frankly, were a bust. But it left me with a large amount of buffalo sauce with no purpose in my fridge. You see, I’m not a huge buffalo wings fan, mostly because I don’t like chicken wings, and what the heck else do you make with buffalo sauce?! It sat there, forgotten, until the light bulb in my brain lit up with a great idea. 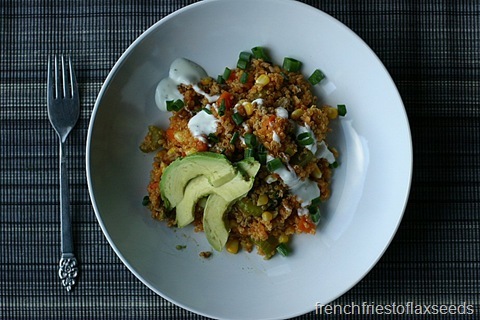 Now I must admit – the idea for a buffalo quinoa bowl was not my own original idea. I know I had seen them on other blogs before, but hadn’t given them much thought, since I never had buffalo sauce around anyways. So the overall concept was not mine, but I did come up with this recipe myself, just based on what I thought went with buffalo chicken wings (carrots, celery, ranch dressing), and what I had on hand (ground turkey, corn). My culinary instinct is generally pretty good, and this was no exception. We ended up with a delicious, super quick, super simple meal. The quinoa soaked up the buffalo sauce perfectly, mellowing out the spiciness so it wasn’t too hot for those who don’t like spice. Carrots and celery are classic sides for wings, so it was a no brainer to add them. And I liked the little bit of sweetness the corn added – along with the ranch dressing, it helped mellow out the spice as well. And while it might be a little high in sodium (thanks bottle sauce), it’s also high in fibre and protein, so I’d still call it a win. Buffalo sauce isn’t just for chicken wings anymore! This easy one dish meal comes together in a snap, and packs in tons of flavour that the whole family will love. Plus it’s high in fibre and protein, so it will keep your tummy full and happy. What’s not to love? 1. In a large pot, bring water to a boil. 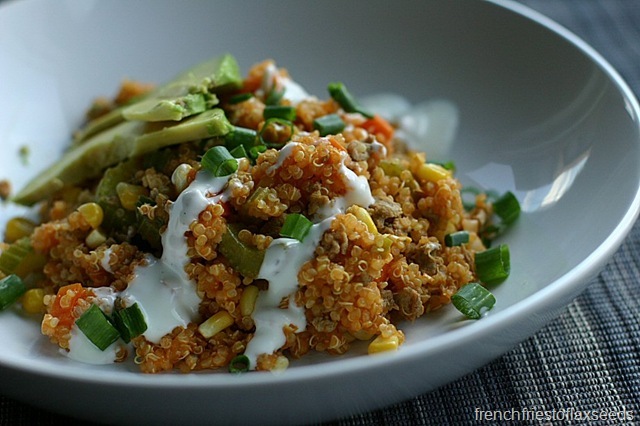 Add quinoa, and cook for 10 – 15 minutes (follow package directions), until all of the water is absorbed. 2. Heat a large skillet over medium-high heat. Add ground turkey, and brown until fully cooked. Break up any large pieces. Remove from skillet. 3. Add oil to skillet, then add the whites of the onion, celery, and carrot. Sautee until softened, approximately 5 minutes. 4. 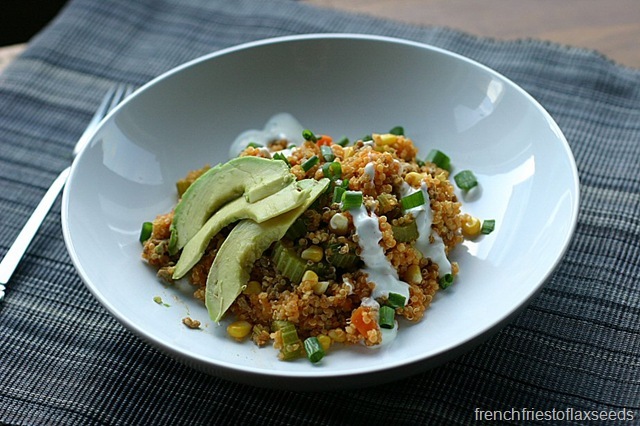 Return turkey to pan, along with cooked quinoa, corn, and buffalo sauce. Stir to combine, and allow everything to heat through. Season with salt and pepper if necessary. Serve sprinkled with remaining green onion, ranch dressing, blue cheese, or avocado as desired. Note: To make a vegetarian version, substitute firm tofu or chickpeas for the ground turkey. Buffalo wings – yay or nay? I’m totally with the nay side on this one! But generally speaking, there are a lot of sad wings out there. Can’t wait to try this one Marianne – thanks for letting me know about it via Instagram! I puffy heart all buffalo sauce stuff! I thought about making those cauliflower buffalo tots, but decided against it – turns out that was a good idea! The cauliflower bites weren’t horrible, but they also weren’t amazing. 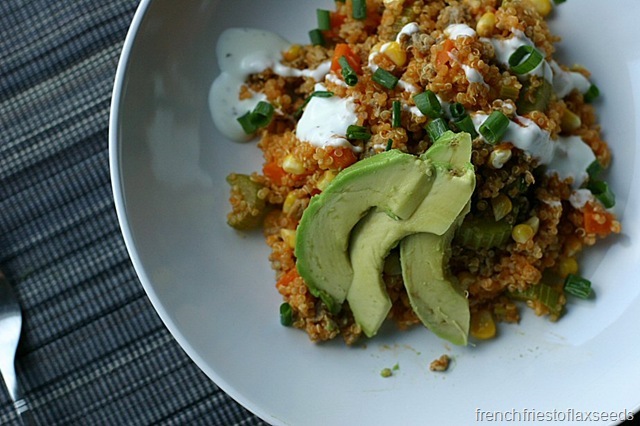 You could probably add cauliflower to the quinoa bowl and that would be tasty, especially if it was roasted.